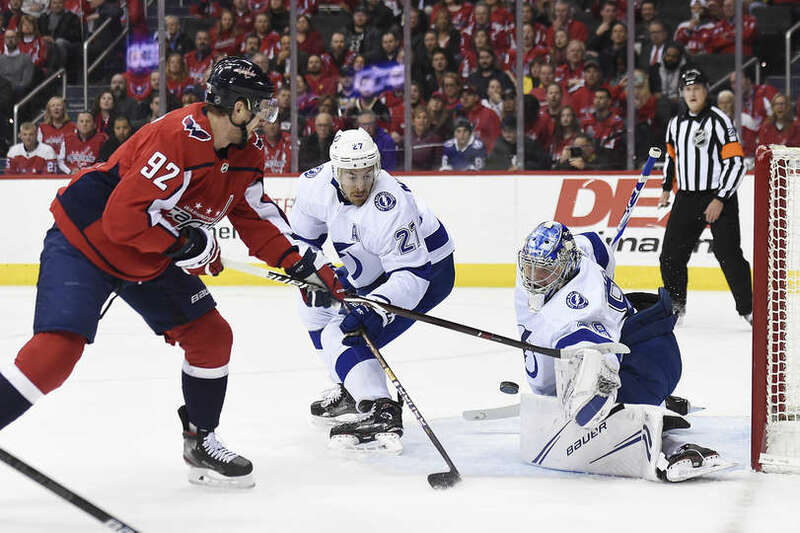 The Washington Capitals fell to the Tampa Bay Lightning 5-4 in overtime Wednesday night at Capital One Arena. The loss drops the Capitals record to 43-24-7 (93 points) on the season. The Capitals are back in action Friday night when they host the Minnesota Wild at Capital One Arena. Scratches: Christian Djoos, Dmitrij Jaskin and Travis Boyd. A fantastic pace to the start of this one with both teams having early scoring chances. The Capitals struck first with a break away goal from Lars Eller at 7:32 of the opening frame. Carl Hagelin picked a pass at center ice and quickly fed Eller for the breakaway. Hagelin was credited with the lone assist. That would be all of the scoring in the first 20 minutes. The Capitals led in shot attempts 22-15 and 15-5 in shots on goal for the opening frame. The Capitals were 0 for 2 and the Lightning 0 for 1 on the power play in the first period. The Lightning would tie the game at the start of the middle frame with a power play goal from Nikita Kucherov at 1:19. Less than a minute later the Lightning would return to the power play, and notch their second power play goal of the game. This time it would be Steven Stamkos at 2:12 of the second period. The Lightning would score a third unanswered goal when Anthony Cirelli knocked one home at 6:45 of the second period to make it 3-1. The Capitals would respond with a goal from Carl Hagelin at 10:30 to make it 3-2 Lightning. A little over three minutes later the Capitals would tie the game with a goal from T.J. Oshie at 13:40 of the second period. But the Lightning would add a third power play goal. Nikita Kucherov would score his second goal of the night at 15:01 of the second period, making it 4-3, Lightning. The second period concluded with the Lightning leading 4-3. The Capitals led in shots on goal 22-11 for the second period. The Lightning were 3 for 3 and the Capitals 1 for 3 on the power play in the middle frame. The Capitals and Lightning battled to a scoreless draw for most of the final frame before Evgeny Kuznetsov potted the game-tying tally at 19:07 of the final frame. The Lightning would win it in overtime with a goal from Victor Hedman at 3:01 of the extra frame. Evgeny Kuznetsov’s goal was the 100th of his NHL career. T.J. Oshie’s goal was the 200th career point with the Capitals (99g, 101a). Carl Hagelin cut the Lightning’s lead to 3-2 with his fifth goal of the season. He had an assist on Eller’s first goal. It’s his 2nd multi-point game in his last four games, two total with the Caps. He didn’t have any multi-point games this season with Pittsburgh or Los Angeles. Michal Kempny sustained a lower body injury in the second period and did not return. This entry was posted in News and tagged Carl Hagelin, Evgeny Kuznetsov, Jon Sorensen, Lars Eller, T.J. Oshie, Tampa Bay Lightning, Washington Capitals. Bookmark the permalink. On tonight’s game: 1) Caps PK was beyond atrocious, as in a 0% PK success. Essentially, the following statement applied: IF (CapsPenalty), OpposingGoal++; 2) And, in contrast, just one powere play goal; 3) Why do they so often melt down after one bad break (Wilson’s penalty) and give up 3 goals in quick succession? ; 4) Kuzy’s goal was sweet. At least we get one point; 5) Vasilevsky was amazing. Made Holtby look like Vesa Toskala in comparison. STs sucked and its unacceptable 1 for 6 on pps meanwhile they went 3 for 3. Unacceptable There will be no repeating if PP doesnt start clicking closer to the 25% rate of years past. 20% of this year wont cut it. Also 5on5 sucked. Yes they had 50 shots but very few were with screens& bodies in Vasi’s face. Also caps are getting out muscled by TB 1st time ever. The 3rd&4Ls the Cirellis,Cernaks, Paquettes etc are bullying the caps lesser physical plsyers bc Reirden is a clueless asshat who refuses to put a DSP/Jaskin on the 4L to be that playoff type physical checking intangible guy. Speed guys like Stephenson dont cut it, I mean hell Kempny took 50 cheap shots and now we gotta worry about him after he got folded up. They need more toughness in the bottom 6!! !